Robert A. "Bob" Smith was born on August 6, 1916 in Big Timber, Montana. His family moved to Fargo, North Dakota, where he attended grade and high school. In 1933 he was the captain and catcher of Fargo's American Legion Post No. 2 baseball team, state champions of North Dakota and he was named captain and catcher of the all-state team. "Bob Smith gets a lot of credit from manager Homer Major," wrote the Fargo Forum on August 11, 1933. "He has handled the pitchers almost faultlessly. He's smart and steady defensively and a timely hitter consistently around .300. The pitchers seldom shake him off, having utmost confidence in his judgment." Smith later worked as an announcer and member of the engineering staff with KRBM in Bozeman, Montana, before entering military service with the U.S. Navy in 1941. He trained as an aviation radioman and was assigned to Alaska as aircrew in a Consolidated PBY-5 Catalina. On June 14, 1942, a seven man crew, including Smith, took off from Kodiak Island, Alaska, to attack Japanese targets at Kiska Harbor in the Aleutian Islands. They encountered bad weather near the target as well as heavy Japanese ant-aircraft fire and crashed on the Japanese-held island - all crew members perished. 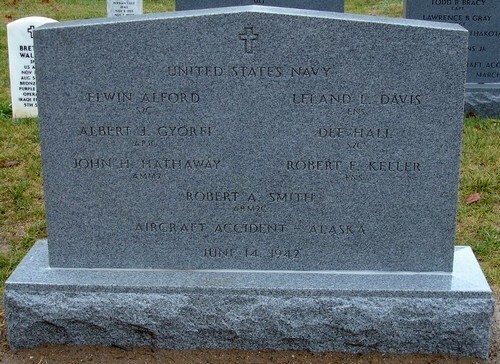 The wreckage was found by American forces in August 1943 and the remains of the crew were buried in a common grave marked "Seven USN Airmen" with a wooden marker. Attempts to relocate the grave after the war were unsuccessful. In 2002, a wildlife biologist discovered the wreckage and the site was excavated the following year. The wooden marker was also located and in May 2006, the remains of the seven airmen were finally brought home to the United States for burial with full military honors. Bob Smith is now buried at the Arlington National Cemetery near Washington, DC. Thanks to Steve Hubbard at the Fargo Public Library for help with this biography.